Let me say this again, I LOVE hellogiggles.com! The articles are delightfully random and always entertaining. I am guaranteed a laugh when I read these. I am beyond thrilled to read this article below by Annie Stamell, whose other Open Letter to Lisa Frank I also adore. Now, let me just get something straight right away my good Sir(s) and/or Madam(s) who comes up with the names of nail polish colors. I envy your job. I do. I would include Nail Polish Name-Giver in a list of my dream jobs, probably before World’s Greatest Magician but maybe not quite on par with Surprise Missing Kardashian Child. I once worked as a trend forecaster (that is a REAL job… I think) so I have some inkling of how this whole naming process works. I am thinking you are presented with the HOT NEW COLORS of the season but they are, sadly, nameless, so you sit in a glass-walled conference room in some nice ergonomic chairs for days on end, during which you read lots of articles in New York Magazine or Wallpaper or High Times or some hipster lady-zine some hipster lady just made up and no one else knows but you because you are so “in the know”. Then you investigate the hottest vacation destinations like Bali or The Bermuda Triangle or Nantucket or Libya and then it is up to you and your team of clever name-givers to then tap into your most creative and more importantly – your most punny. I think nail polish naming must be sort of like the make-up industry’s version of taking Ayahuasca and meeting your inner spirit animal while sitting in a sweat-lodge with a shaman for three days. Because really, how else could you possibly come up with the names for Essie’s latest collection? It’s Braziliant! Which in this case is both a pronoun, an adjective and definitely a made-up word that I like to say the way taht I imagine Oprah would say it, with lots of extra vowels and a hug. In the Braziliant collection you have reached a new height with your puns, thanks to the especially alluring sea-foam color “Absolutely Shore.” Well let me tell you, I am absolutely SHORE I would like to wear this color on my toes but only when I’m really tan, because otherwise it just looks like I contracted a fungus. I love the nail polish color names that really say a lot about the person wearing them. Like “Hi Maintenance” which to me says, “I am high maintenance. Also, hi.” Or “Trophy Wife” which says “I am clearly not a trophy wife because no self-respecting trophy wife wears shimmery green nail polish, although I’m not sure if trophy wives really do respect themselves in the first place.” And then there is “E-Nuf Is E-Nuf” which tells me you are either a huge e.e. cummings fan or you are a 16-year-old sending text messages to your mom to totally just leave you alone for once, gosh. And it’s not just Essie. 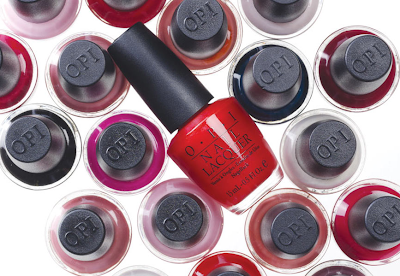 The Sirs and/or Madams who work at OPI are equally talented in the punny department, if not moreso. Just take a look at “Do You Think I’m Tex-y” (that makes no sense) or “Red My Fortune Cookie” (probably a little racist), or my favorite of the OPI punny selections – “Here Today… Aragon Tomorrow” (which contrary to popular belief is not a special edition Lord of the Rings nail polish line even though I wish it was). It is my dream to someday inspire a nail polish collection, at which point I hope there are still untapped puns to tap. So if you could just be a little less clever with your punny names until I get my nail polish collection that’s partially inspired by the prints of Lilly Pulitzer and the sound of a baby laughing, it would be really just so very Braziliant.